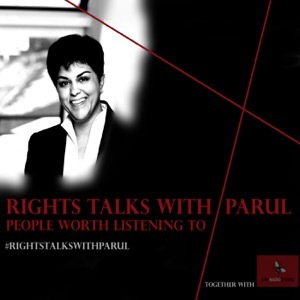 Very welcome to Rights Talks with Parul, and people worth listening to. Parul Sharma, is a Human Rights lawyer based in Sweden with extensive knowledge within rights based issues. Parul has successfully hosted a popular Swedish podcast on the UN Sustainability Goals, Agenda 2030. In this podcast you are going to listen to a number of experts, stakeholders, and forces within various rights issues. LGBT rights, the challenges of modern slavery, women’s rights, animal rights, right to a clean environment, the growth of surveillance states and the violent pressures on journalism, dramatic populism and so on. We have tried our level best to represent a multi ethnic fabric and a broad representation. The history of civilization has been story telling, this podcast will continue this tradition. Because words matter, lives matter, and life stories matter too.